What is Alert Crook County Emergency Notification System? This service allows you to sign up to get emergency alerts on your cell phone, work phone, text message, e-mail, home phone, and more. You can also choose the locations you want to be contacted about. You can receive notifications about emergencies that may affect your home, your parents’ home, your workplace, and your child’s school, as long as those locations are within the boundaries of the city or county. The system will be used to notify residents about imminent threats to health and safety. Emergency Services Officials will send alerts about emergencies such as severe weather, floods, gas leaks, or critical Fire or Law Enforcement activity. If you don’t sign up, you will still receive notifications on your traditional home phone, but nowhere else. Since we have loaded the telephone company’s 911 database. The system is only as good as the information you provide. If your cell phone, work phone or email address changes, you must go to your profile and update the information. The one exception is traditional landlines. If a traditional landline changes to another landline number, that information will be automatically updated. No, the information that you provide will be used for emergency purposes only. Contact the Crook County Emergency Manager at michael.ryan@co.crook.or.us or by phone at: (541)416-3969. 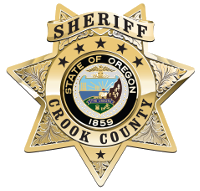 Privacy Notice: AlertCrookCounty.org is operated by Crook County 9-1-1 on behalf of its user agencies. Information provided through this website will be considered confidential and protected under law. By accepting the Terms of Service to register for an account you agree that you are providing us with this information only for the purposes of emergency notifications and request that your personal information be kept confidential.